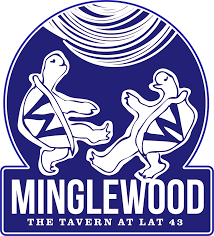 Voted “Best of the North Shore” for Dancing, Minglewood Tavern is THE spot for live music in Gloucester. Minglewood is a bustling tavern that boasts 20 beers on tap. The menu is filled with tavern classics, like burgers, nachos, wings and fish & chips. Guests can also order award-winning sushi from Latitude’s sushi pit, which is right down the hall. Between food specials, trivia and live music, there is always something going on at Minglewood. Summertime specials include Kids Eat Free Sunday, 43 Cent Wings & Trivia Tuesdays, Tres Tacos Wednesday with $4 tacos and a weekly margarita special, and TGI Friday with 1/2 priced appetizers from 4-6; PLUS live music Thursday – Saturday! Minglewood is undergoing some renovations and will be reopening in Spring 2019 with a new look.